The work of Henri Lefebvre - the only major French intellectual of the post-war period to give extensive consideration to the city and urban life - received considerable attention among both academics and practitioners of the built environment following the publication in English of The Production of Space. This new collection brings together, for the first time in English, Lefebvre's reflections on the city and urban life written over a span of some twenty years. 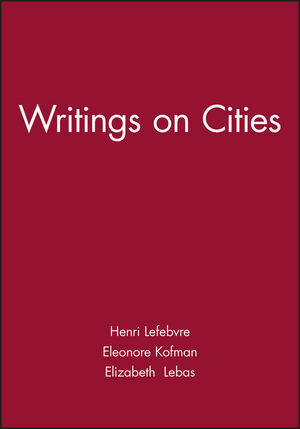 The selection of writings is contextualized by an introduction - itself a significant contribution to the interpretation of Henri Lefebvre's work - which places the material within the context of Lefebvre's intellectual and political life and times and raises pertinent issues as to their relevance for contemporary debates over such questions as the nature of urban reality, the production of space and modernity. Writings on Cities is of particular relevance to architects, planners, geographers, and those interested in the philosophical and political understanding of contemporary life. Eleonore Kofman is Professor in the Department of International Studies at Nottingham Trent University. Elizabeth Lebas is Senior Lecturer in the School of Geography at Middlesex University. Both have researched and written extensively on French urbanization and urban theory. 1 Lost in Transposition-Time, Space and the City. Part II Right to the City. 4 Philosophy and the City. 5 Fragmentary Sciences and Urban Reality. 6 Philosophy of the City and Planning Ideology. 7 The Specificity of the City. 9 Levels of Reality and Analysis. 11 Around the Critical Point. 14 The Right to the City. 16 The Realiziation of Philosophy. 17 These on the City, the Urban and Planning. Part III Spaces and Politics. 19 Institutions of a Post-technological Society. 20 No Salvation away from the Centre?. 21 The Urban in Question. Part V Elements of Rhythmanalysis. 22 Seen from the Window. 23 Rhythmanalysis of Mediterranean Cities. The introduction helpfully contextualises the selected material within Lefebvre's intellectual life and times.